Description: CSX power leads a westbound piggyback train past Frontier Yard. Description: Q416 waddles out of Brunswick Yard for Cumberland on the Valley Lead (I think that was its name). Description: In the Fredericksburg yard. Description: CSXT 6151 train Q308 at Bardane. Description: Distorted by the heat waves. 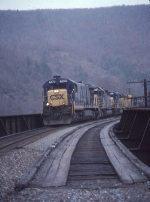 Description: CSX Q751 heads down the Sheanandoah Sub with a rock-runner train. Power is 6151, 2673, 4408, and 6033. Description: Light engine moving heading north to the site of a derailment near Quantico. Description: EB trash train idles on track 2 while B&O dwarf CPL signal indicates the imminent arrival of WB freight Q439 on track 1.